In the gear world, as in the regular world, there's a constant tug-of-war between the time-tested and the newfangled, the tried-and-true and the next big thing. Stay in the past, and you'll get left behind--but innovate too fast, and you'll end up with something that looks better than it works. Marker found the sweet spot with the Kingpin 13 AT Binding, which cribs plenty of reliable tech from classic two-pin bindings, takes cues from the successful Royal Family series, and adds a whole mess of brand new to create a clamp that's almost as light as a classic tech binding, as versatile as a Duke, and as powerful as a traditional alpine binding. Let's start with the toe, which is the most recognizable piece of the Kingpin. In classic style, it uses two spring-loaded pins to secure your boot, has a locking ski/walk switch, and sports adjustable boot stops for easy step-in. The differences are in the mounting pattern (a super-wide 38mm for efficient power transfer on wide skis) and the spring configuration, which uses Marker's Six Pack setup to provide greater energy absorption and contact pressure than a four-spring setup, reducing unwanted release in ski mode and giving you a smoother ride. 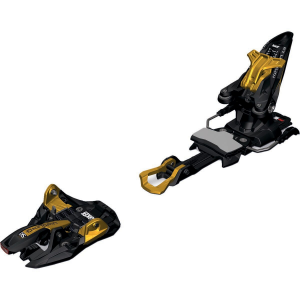 There's also an integrated crampon adapter for stress-free ascents up bulletproof snow or in no-fall zones. The toe's cool, but it's in the heel that the Kingpin really shows the world who's boss. Marker's XXL Power Transmitter is damn similar to an alpine heel--the step-in function is the same, it has a beefy anti-friction device, and rocks alpine-style brakes that lock up in walk mode--but with a few key differences. First, it's TUV-certified, making it the first tech binding that can actually claim to have real, measurable, and repeatable DIN settings, not just "release values." Second, it pivots laterally to provide consistent release and retention, with plenty of vertical elasticity as well, so you have a powerful alpine connection instead of that rattly tech-binding feel. To..